Photographer QT Luong made repeating visits during 2011 and 2013 to Hawaii Volcanoes National Park shooting a time lapse of the volcanos on the park. Shot on 5Dmk2 & 5Dmk3 cameras in 2011 and 2013, mostly in Hawaii Volcanoes National Park, its filming was a wild solo adventure in itself. 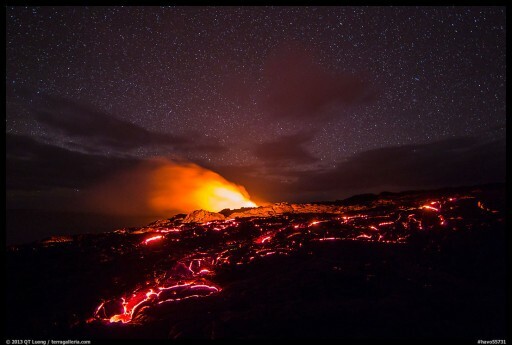 The photographer stood just feet away from lava flows which reach temperatures of 2000F, using a respirator against toxic gases, and stayed nearby for an entire night. He backpacked on sharp and unstable lava rocks for a dozen miles to reach the 13,700 feet Mauna Loa summit, camping there despite fierce winds and nighttime temperatures that were cold enough to freeze his water bottles.